Opticraft's Legacy server (original SMP) is no longer being maintained and may have broken or missing features. Read the information on this page to make the most of our Legacy server, it includes help, commands, links and much more useful stuff. Good luck! Opticraft is a non-PVP survival server. It is fitted with ranks, economy, and an anti-grief system to enhance your playing experience. Take the time and type /rules on the server for a list of our rules. All we ask is that you respect	other players and follow the rules while on our server. Our	server has a multiple world system. The world you spawn in is the Guest	world and is accessible by anyone. The other worlds include older Guest worlds, a Member+ world and a PVP arena world for private battles. To become a Member simply sign up on this website, you will automatically gain access to it! It is highly recommended you build on Member worlds as they are less likely to be griefed. 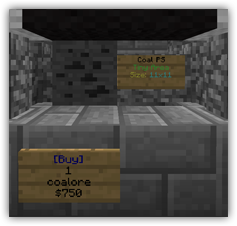 Once registered on opticraft.net, you get promoted to the Member rank and get a starter kit that includes a free coal protection stone. Most importantly, you get access to the Member+ world via /warp MemberWorld. Players that are trusted by the Senior Staff of the server (Operators and	Admins). They have the ability to place water and can apply for the Moderator rank. There is no set requirement for this rank, just be sociable, get well known, and most importantly, do NOT ask to be promoted. The top 3 players who have voted for us in the past month, a new top 3 is achieved every month. Votes keep the server alive and bring new players. Moderate the server and it's players. They can undo grief, punish rule breakers and make sure all of our players are following the rules. Part of our Senior Staff team, they are experienced Moderators who give advice	and help out the Moderators. They have access to more commands and can fix most problems. The owner of Opticraft. He pays for the server along with coding many of the custom plugins that make playing on Opticraft an enjoyable experience. When things go wrong he takes a look at it and fixes them. You start as a Guest. In order to move up the ranks, you must contribute positively to the server. This means following the rules, showing maturity and helping out. Do not ask to be promoted! The server has an economy system. As a player, you have a credit balance which can be used to purchase items from the market or players. To see how much money you or another player have, type /balance <name>. To view the richest players on the server, type /balancetop. You can exchange goods and credits with other players with /pay <name> or with the server's market. To access the market area use the warp /warp market. Inside the market there are items on display with signs below or above them. Right click the sign on the [buy] to buy the number of that item that is displayed on the sign. Right click the sign on the [sell] to sell the number of that item displayed on the sign. Please note that not all items are available to be bought or sold at the market. If you are looking to trade items or services with another player, use the trade chat channel to buy and sell them. See the Chat Channel section for information on changing channels. This server uses a plugin that allows players to buy stones that protect a given area allowing only the player, and whoever they choose, to modify blocks inside that area. New players who register on these forums to gain the Member rank automatically get a free coal protection stone! This is the smallest protection stone we offer, it is very cheap and is useful for protecting small areas or buildings you intend to rent to other players. This is the second largest protection stone we offer, for the size it protects the price is very reasonable. Use this to protect medium sized builds, 8 times the size of the coal protection stone. This is the largest protection stone we offer, it protects a very large area, 8 times the size of the lapis protection stone. Use this to protect large builds and whole towns. You may also want to allow other players to build within the protection zones so they can help you build. To do this, you can use the following commands. Once placed, protection stones can be broken and picked up so you can move them from place to place. They will not break forever! Opticraft uses LWC to protect chests, doors and other personal items ingame. This plugin enables users to protect their items so that no one is able to steal from them or use them without permission. By default any door, chest, furnace and trapdoor you place will automatically be protected so that only you can access	it. However, sometimes you will want to allow other players to access your protections, or you may want to remove the protection altogether. Use the following commands to do just that! /cmodify <name> - Allow someone else to access the protection. /cmodify <name> - Remove someone's ability to access the protection. /cremove - Remove the protection alltogether. /cpassword <password> - Set a password on the protection. The server's chat system makes use of HeroChat plugin in order to provide focused channels for chatting. There are three channels in the server, Local (default), Global and Trade. In order to change channels, you can use the command /ch <name>, where name is the first letter OR name of the channel, for example: /ch g.
If at any time you feel overwhelmed by the chat, you can use /deafen to mute everyone besides staff members. There are a number of other channel commands. To see an up to date list, simply type /ch help ingame. By voting for the server you can help us grow, which is really important! In order to show our appreciation for your votes, we reward you with a diamond for every vote on each site we are listed on. We also give you access to a second home for free, as long as you have voted in the last 12 hours! You can vote on xtremetop100 every 12 hours, and the sites every 24 hours. This means you can earn 5 diamonds a day, just by voting! In conjunction to that, we also reward the top 3 voters each month with a special Voter rank and title, as well as $30, $20	and $10 in donation rewards. Donations help the server remain running and show us your appreciation for the service we are providing. When you donate, you can choose from a number of cosmetic rewards such as mob disguises or titles! /balance - Shows you how ingame money you currently have. /balancetop - Shows the top 8 richest players, has multiple pages. /compass - Shows which direction you are facing. /cprivate - Allows you to lock doors and chests, all doors and chests are locked by default. /cremove - Removes the protection on a door or chest that you own. /cpublic - Make the protection on a door/chest you own public. /cpassword - Allows you to lock a door/chest with a password. /depth - Shows your elevation compared to sea level. /getpos - Gives you the map coordinates of your current position. /pay - Allows you to pay another player money. /spawn - Teleports you to the spawn.